I took these apple and cranberry cupcakes from my new cupcake book and made them healthy. I felt better about replacing the flour with spelt and whole wheat and the butter with a little bit of canola oil and applesauce. I also greatly reduced the sugar content. It was surprisingly simple to do and I thought they still tasted very good. 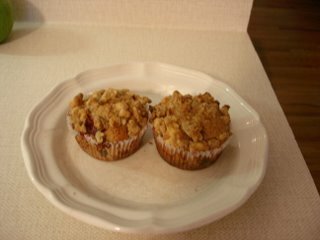 These cupcakes/muffins were loaded with walnuts too! Walnuts are recognized as being able to reduce cholesterol and can also reduce heart disease and inflamation. Walnuts are also loaded with omega threes and a great source of proteins for vegetarians.